Design: Curved mouthpiece with jointed barrel in center. The Myler Mullen Barrel mouthpiece is a good choice for the intermediate horse. 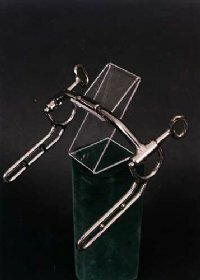 With the strength of the solid Mullen mouth, this bit encourages the horse to break at the poll, but keeps him from getting behind the bit, or inverting. The independent side movement allows the rider to isolate one side and pick up a shoulder. Used in single driver and or team driving. Depending on the location of the horse, can be used in multiples. Also available with bushing.